Once you've been around the writing scene for a while, you know that there are hundreds of middle of the road books about writing that don't offer anything new, but sometimes new information isn't what you need. You need something that helps you grapple with the principles you already know. A new way to see story elements that's going to click with the way your mind works. 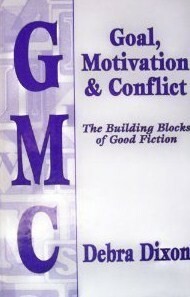 Debra Dixon's Goal, Motivation & conflict is one of those extraordinary books that does that. In a recent story I wrote, my hero and heroine started life with full-blown goals, motivations, and conflicts. I knew exactly what each of them wanted from page one, why they wanted it, and what stood in their way. It was a gift from the gods. All I had to do was stand back and watch them fight for what they wanted. *sigh* If only all characters came so fully equipped. Most of the time you have to equip your characters yourself. How to do that is the main thrust of GMC . Even if you already know that your characters must want something (goal) and you know why they want it (motivation) and why they can't have it (conflict), this book is still worth having in your library. One of the reasons is because, if you're anything like me, you sometimes confuse the elements. And it's easy to do. If you'd asked me before I read this what my heroine's goal was in the story I channeled, I'd have said, "to have a family of her own" but that's actually her motivation. GMC provides a formula to encompass the three elements. That formula comes down to 3 words: want, because, but. The little girl wants ice cream because all the other children at her birthday party are having ice cream but she's lactose intolerant. And there you have it: goal, motivation, and conflict. Interestingly enough, this formula comes in handy when you need to pitch your story. But it's not always that easy for me. One of the examples Dixon uses extensively in GMC is Casablanca. In the beginning of the movie, Rick's goal is to keep the bar open, but what's the motivation? Initially, I drew a blank because, for me, the fact that he needs money is so basic and so universal that I skate right over it. It's a "duh" motivation. But apparently, "duh" motivations are valid. My guess is, however, that if you have a "duh" motivation, your either going to need interesting goals and conflicts or have additional goals for the character to keep the reader engaged. While identifying the GMC is the book's main thrust, Dixon touches on other things: black moments, showing vs. telling, viewpoint, dominant impressions, urgency, and query writing because these things tie to GMC. She handles each subject with the clarity that has made so many aspiring writers find a permanent place on their bookshelf for this book. What revelations have you found in writing books, magazines, or websites? Which resources do you recommend to others? Wants, because, but....that's a great way of organizing it. Thanks for the information. Thanks. Great article. I will definitely look into this book. This reminds me of another book that this could go hand-in-hand with: "Techniques of the Selling Writer" by Dwight Swain. In it he suggests ways of writing using Motivation-Reaction Units (MRUs) that help propel the story and the reader forward. This dynamic almost creates an engine that churns one through the story. He also suggests ways of writing scenes, or rather Scenes (Goal, Conflict, Disaster or Hook) and Sequels (Reaction, Dilemma, Decision) which also creates this engine on another scale. So I see Dixon's strategy for overall story (Goal, Character, Conflict) combining with Swain's small scale and large scale scene structures to create some very powerful stories and reads. FYI there is a good article on the Swain technique at advancedfictionwriting.com; just look for the article on "Writing the Perfect Scene". Thanks again for sharing. Thanks for reviewing this book, and the "W,B,B" filter. Wow! I'm definitely excited to read this blog post, because I felt so alone. It seemed like I was the only person who was writing while using story writing theory, so I was feeling very lonely. But I don't any more. I use a lot of screen-writing books. I started with the screenwriting books after I learnt about the hero's journey, from 'the Writer's Journey' by Christopher Vogler. I used to have trouble finishing stories because I'd be unable to continue writing after I lost the inspiration. I had lots of unfinished novels. But after learning some writing theory it became easier to write more. So I learned more theory, and I could write even more! Now I'm doing the third draft of a novel and I'm really excited!